Forget Me Not is a trio from Bristol with a rich musical history and close association to the city from which they hail. As solo artists they have put out countless d&b 12_s and now combine their forces into an even more powerful production outfit. And that'''s all we are telling you ahead of the release of their four track EP, Stronger, on Losing Suki. Opening with '''Should Be Stronger''' Forget Me Not suggest they are indebted to no on scene in particular, with Pantha du Prince styles bells forming a backdrop, slinky, glistening percussive slices chopping up a bump and grind beat and watery vocals bleeding their way into every gap in the arrangement. Fresh sounding stuff indeed, but if you prefer it sans vocals fear not, for an instrumental is also included. '''Big Tings''' is as tightly coiled and kinetic as a Mosca production. Slapping mechanical hits are offset with more syrupy synth work in the background and a catchy female vocal echoes in the spaces in between. The results are as rude and vibey as any prime garage cut without sounding like a tired pastiche. Finally, '''How Long''' somewhat recalls the trio'''s d&b past with its hollowed out, steppy percussive rhythms, neon pads and carefully balanced sense of crescendo throughout. When it finally drops proper in the final third with a healthy dose of sub bass, ribs get rattled and a pervading sense of euphoria wholly washes over you. 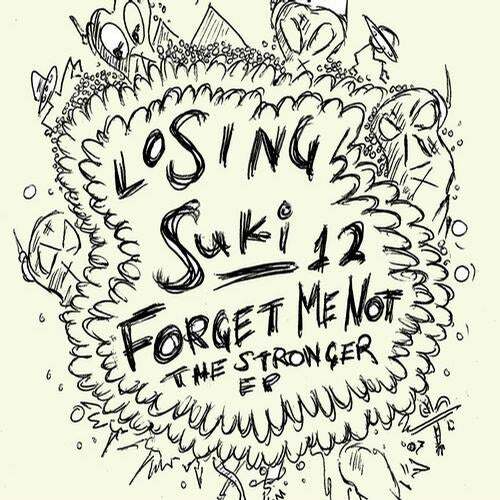 A diverse EP that moulds and mutates a broad array of UK specific influences, Forget Me Not prove themselves to be an aptly titled trio with this Losing Suki debut.